Lets say you have fantastic video, but extremely uncooperative noise in the audio. Lets say you have a song/soundtrack you want to take from another video, without having to splice together both videos. Well in today’s entry I’ll demonstrate how to take just the video and just the audio from your video clips. Lets begin. I have two movie clips. One from an old Japanese Godzilla movie and the other the final shot from the movie “Hoosiers”. 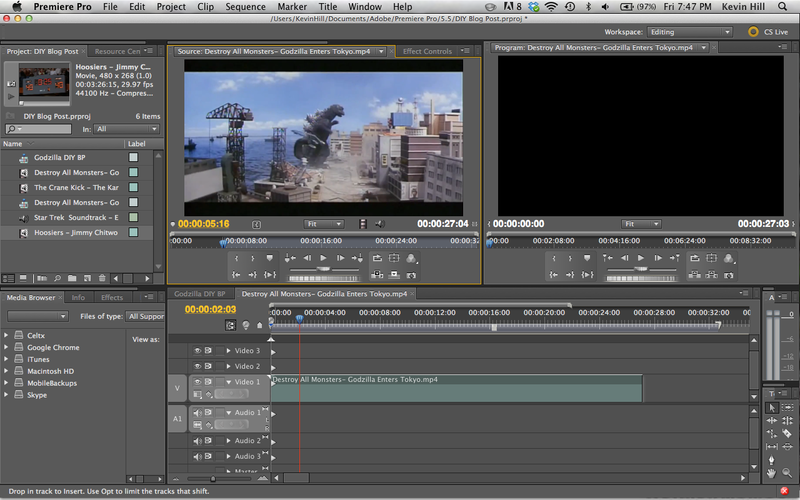 For some odd reason I want to add the movie score from Hoosiers into my Godizilla video. Take your video and add it to your source. 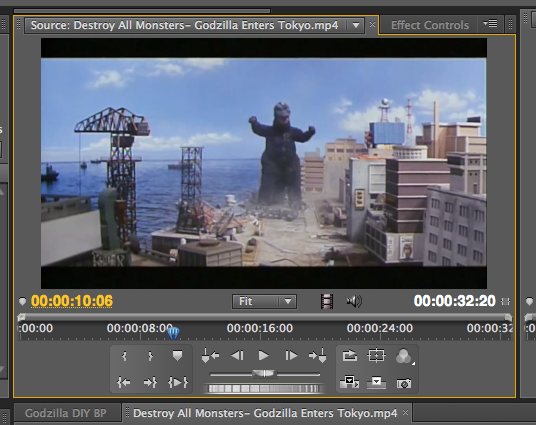 In source you can play around with the clip in a separate window before adding it to your sequence. 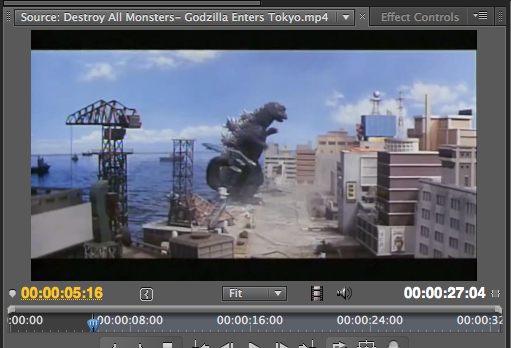 We want just the video of Godzilla destroying Tokyo though, which I’ve pinpointed to be at 5.16 seconds. Press “i” on your keyboard to take the video from only that point on. Then go to the Drag Video Only Icon, which looks like a film strip right below your sources video. Click on it and drag down your video to the “Video 1” bar of your sequence. You’ll notice on the right screen of your project that only the video plays, sin audio. I now want the soundtrack from Hoosiers, so I’m going to double click on my imported Hoosiers clip so it’ll appear in the source. Notice how my Hoosiers clip is in the left (source) screen and my actual sequence is on the right screen. The soundtrack I want doesn’t start until the end of the clip, so I press “i” when the music starts and “o” when the music ends. Then you choose the Audio Only Icon, which is the Universal Volume symbol next to the Video Only Film Strip Icon. Drag just the audio down to the A1 Audio bar and you have your video from one clip and audio from another playing together in the right screen. If the audio is too loud you can drag the yellow line in your audio down to make sure it never gets close to zero. And that’s it. It’s quite simple. If you have an audio file (.mp3, .wav, etc.) you follow the same process for adding separate audio to video. ~ by kevhillnyu on November 8, 2013.